A parliamentary report of 1777 recorded parish workhouses in operation at Ardleigh (for up to 40 inmates), Beaumont with Mose (14), Little Bentley (26), Bradfield (12), Great Bromley (30), Great Clacton (30), Harwich—Dover Court (8), Harwich—St Nicholas (60), Kirby (24), Lawford (22), Great Oakley (20), Ramsey (14), Tendring (20), Thorpe (50), and Wix (25). 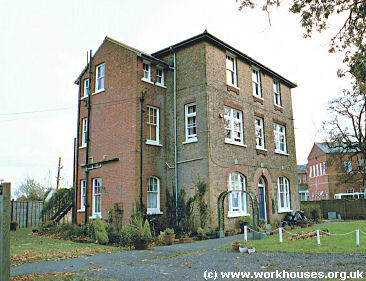 Tendring former parish workhouse, c.1910. Harwich had a parish workhouse from 1669 on Cow Lane. Great Clacton's workhouse was on the site of what is now 241 Old Road, its position indicated on the 1876 map below. Claction parish workhouse site, c.1876. Essex: Alresford, Ardleigh (2), Great Bentley, Little Bentley, Beaumont-with-Moze, Bradfield, Great Bromley, Little Bromley, Great Clacton, Little Clacton, Elmstead, Frating, Frinton, Great Holland, Little Holland, Kirby, Lawford, Manningtree (2), Mistley (2), Great Oakley, Little Oakley, Ramsey, St Osyth (2), Tendring, Thorpe-le-Soken (2), Thorrington, Walton-le-Soken, Weeley, Wix, Wrabness. Later Additions: Brightlingsea (1838-1880), Dovercourt (1838-1925), Harwich (1925-1930), Harwich St Nicholas (1838-1925). The population falling within the union at the 1831 census had been 21,002 - ranging from Frinton (population 35) to Thorpe-le-Soken (1,173) with Tendring itself having a population of 758. The average annual poor-rate expenditure for the period 1833-35 had been £17,850. The new workhouse was built in to a design by Scott and Moffatt, who also designed many other workhouses including Bedminster, Windsor, and the nearby Billericay. The building, for 300 inmates, was erected in 1837-8 on a site at Tending Heath and cost around £12,000. Its location and layout can be seen on the 1880s map below. A single-storey entrance block faced west. Behind this, the wings of three-storey main block emanate from a central hub. 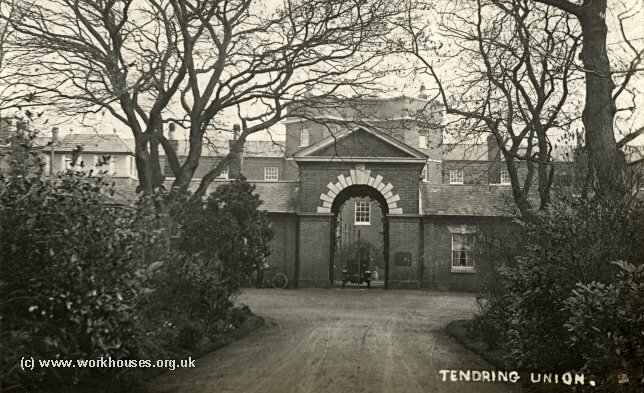 Tendring entrance from west, c.1914. Tendring general view from north-west, 2000. Tendring entrance block from south, 2000. Later additions to the site include a 94-bed infirmary at the south-east and a nurses' home which were erected in 1901 at a cost of £12,800. Tendring nurses' home with infirmary behind, 2000. A VERY enjoyable evening for both young and old folks at Tendring Workhouse was provided on Friday evening by Mr. Samuel Jones and Mr. Sydney Davis, who journeyed over from Frinton to entertain the inmates with a long series of cinematograph pictures. The cinematograph was in the capable hands of Mr. James, and the incidental music was played by Mr. Davis. The entertainment was a huge success. Mr. Davis generously provided each old man with a gift of tobacco, each old lady with fruit and each child with sweets. 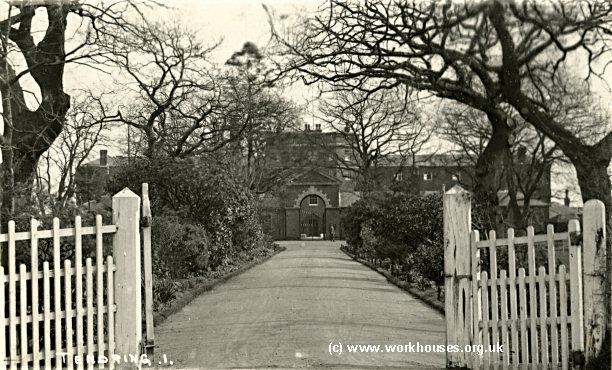 The workhouse later became Heath Hospital for the Chronic Sick, and then Tendring Meadows Nursing and Residential Home. By 1920, a pair of children's cottage homes known as 'The Firs' and 'The Limes' had been erected on Heath Road a short distance to the south of the workhouse. The former 'Firs and Limes' cottage homes. 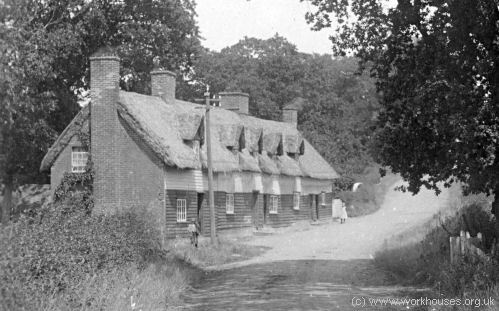 In 1930, the running of the homes was taken over by Essex County Council who erected another pair of cottage homes known as 'The Oaks' and 'The Chestnuts', just to the north of 'The Firs' and 'The Limes'. The 'Oaks' side housed the girls, and the 'Chestnuts' side the boys. In the 1950s, the staff 'aunts' at the homes included Doris Howard, and Ann and Mary Richardson. In 1963, the property was sold off and became the Springbank care home which still occupies the premises. The former 'Oaks and Chestnuts' cottage homes. Essex Record Office, Wharf Road Chelmsford CM2 6YT. Holdings include: Births (1839-1930); Baptisms (1907-30); Deaths (1839-1930); Creed registers (1889-1930) ; etc.